Northern Oil & Gas had an exceptional year in the Bakken. The company grew production 95% or from just under 2 million boe in 2011 to 3.76 million boe in 2012. That equates to daily production of more than 10,000 boe/d in 2012. Production growth was the result of Northern participating in the drilling of 42.8 net wells and bringing 48.3 net wells to production at a cost of $485 million. 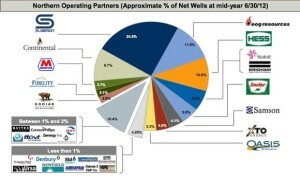 Michael Reger, CEO, commented: "2012 was a year of operational transition in the Williston Basin. Throughout the year, drilling costs peaked and abated, wellhead price differentials peaked and subsequently improved to some of the play`s best levels and operators began the transition to pad drilling. The company realized an average oil price differential of $9.79 per barrel in 2012, which compares to $6.30 in 2011. Differentials are expected to trend lower in 2013 as WTI prices trade lower than current Bakken markets that can be reached by rail on the East Coast and West Coast. As well as earning 6,450 net acres through farm-ins. An estimated 64% of the company's acreage is held by production. Northern plans to spend between $420-440 million in 2013. Approximately $370-390 will be spent on drilling and completing wells and an estimated $20 million will be spent on acreage acquisitions. Plans call for the drilling and completion of 44 net Bakken and Three Forks wells. Production is expected to grow 3,000 boe/d to 4.7-5 million boe for the year. The benefits of multi-pad drilling are expected to be realized in the second half of 2013.